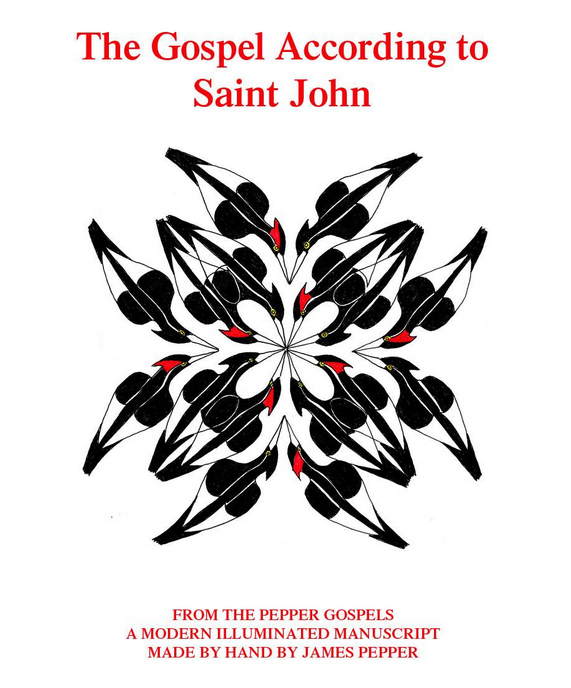 An illuminated Manuscript of the Gospel According to Saint John by James Pepper, part of the Pepper Gospels. The work is entirely by hand without the use of computers. . This volume, contains dozens of original illustrations, this book is a devotional treasure. The cover features a flock of Ivory Billed Woodpeckers, the mating pairs are flying in formation to form a cross. The bird was thought to be extinct, but were found near the Mississippi River and the birds are used here to represent Resurrection.